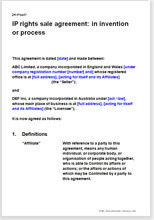 This a heavy weight agreement for sale of rights to an invention or technological innovation. You may be an individual or represent a company. Your work may be applicable in one industry or many. It could be anything. You want to sell all rights to a major manufacturer. Sale limited to a particular market or industry. You probably intend to sell rights for use in other industries or to manufacture it for your own use in your industry. We have named the subject of this product “Excalibur”. You can rename it or give it an abstract legal name like “Licensed Product”.